Friedrich Wilhelm Krabbenhöft (1853-1923) established a trading enterprise in Gibeon in 1880. When diamonds were discovered in Lüderitz in 1908, Krabbenhöft and Oskar Lampe, who had come to the colony in 1898 and partnered Krabbenhöft in his trading ventures, decided to move the core of their trading business to Lüderitz. The structure known as the Krabbenhoft & Lampe Building was erected in 1909 for Oskar Lampe with the purpose of being used as a combined residential and business premises. It is assumed that the architect was F Kramer and the builder, FH Schmidt"
It was probably the firm's original intention to use the building for commercial purposes since the plans were drawn up in the course of 1909. (zawp) By 16 November that year, the firm was officially registered, with Oskar Lampe and Krabbenhöft as its partners. According to the plans, a three-storeyed building was initially envisaged. Although this idea was abandoned, the building was built in such a way that a third storey could be added later if so desired. Today, the roof is constructed where the third storey should have been, and the five windows of that unbuilt storey now form the present dormer windows. Some additions were made in the form of annexes in 1913, but the front of the building has never been modified. The bricks for the building were imported by ship from Cape Town. The rafters and roof tiles of the main building originated in Germany. The architectural appeal of the Krabbenhöft & Lampe Building lies mainly in the five roof dormer windows, two of which are decorated with pointed tops. The building bears neo-Renaissance features in that the building has the appearance of a small Venetian palace (palazzo). The lower storey was plastered in a rustic fashion with the brickwork lines in evidence, while the upper storey is smooth. Minor symmetrical defects are detectable under close scrutiny of the façade, which however do not detract from the overall architectural quality of the building. 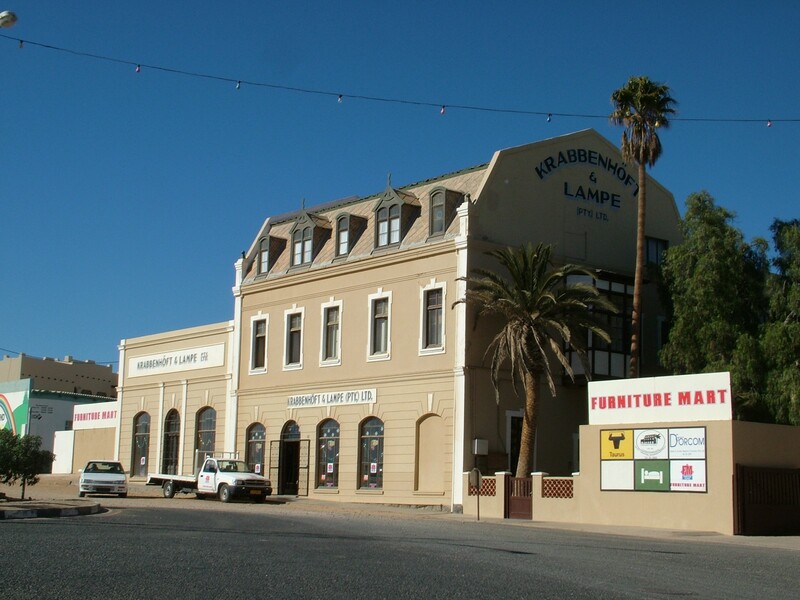 The Krabbenhöft & Lampe Building is situated on the corner of Berg and Bismarck Streets in Lüderitz, in the Karas Region. The building, given an A Class rating and a score of 81 on the NIA Index, was proclaimed a national monument on 20 December 1979.